On 15th December 2017, four strong players in the luxury sector came together to interact and inspire the students of Master in Global Luxury Management, SP Jain’s partnership postgraduate program. With the intent to share their perspectives about various aspects of business, the guests participated in a congenial discussion with the students, taking them on an inspiring journey of their personal experience and their achievements at a professional front. On 29 November 2017, SP Jain’s Luxury Management cohort participated in their third Conversation Series with the women leaders of the Luxury industry. On 17 November 2017, the students of Luxury Management’s Batch 03 participated in the first session of the Conversation Series. The panel consisted of Suman Agarwal - Image Consultant (ICBI); Firdaus Rana - VP of Sales Taj Group; Hiral Shah - Food Blogger and Entrepreneur; and Gazal Mehta - Jewellery Designer (Ansh Gems). Engaging the students in the rich history of Taj, explaining the difficulties of starting a career in image consultancy, describing the difference in functioning of the different hotel chains in the country, understanding the intricacies of jewellery designing, and gaining insights into the wide and developing arena of food blogging – the Conversation Series was an eye-opener for the students of Luxury Management. As the first conversation series came to an end, it left the students a little inspired, a little intrigued and for some, even a little excited. The Conversation Series acts as a constant and progressive learning experience for all the MGLuxM students. The series helps widen their insights and bridge the gap between their academic learnings and industry exposure, managing to successfully engage the students into a practical and realistic goal setting and thinking. The students of MGLuxM (Intake of April 2017) recently attended their last session of the Conversation Series for their Term 1 in Mumbai. 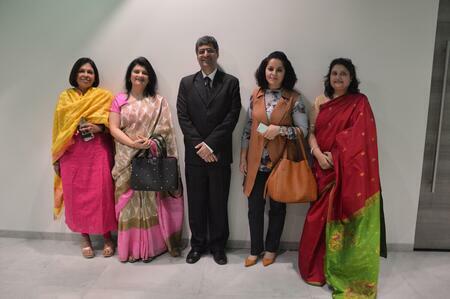 The panel was graced by industry experts like Sachin Jain (M.D. – Forever Mark), Nandita Ganesh (Visual Merchandiser – D’décor), and Akash Chandravanshi (Visual Merchandiser – LVMH). 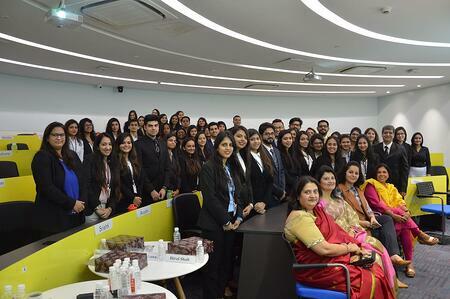 The Orientation program was organised for the students of Masters in Global Luxury Goods and Services Management Batch-02 at SP Jain’s Mumbai Campus on the 3rd of April, 2017 in collaboration with MIP Politechnico di Milano Graduate School of Business. 6th December, 2016 marked the beginning of the conversation series for the Luxury Management students. The first of the many to come was on luxury cars, titled, "India's Obsession with Luxury Cars- Challenges Faced by the Luxury Auto Sector in the Indian Market". The students were joined by some of the stalwarts of the industry as the guest speakers. The distinguished speakers included Mr. Santosh Iyer, Sales and Marketing Director of Mercedes; Mr. Gautam Modi, MD of an Audi Dealership; Tarun Jha, Head of Marketing and Product at Skoda; Srikant Madhavan, from Tata Motors Finance; and Nitin Khanna from ICICI Lombard.